The sweet and icy glory of gelato dates back to the early beginnings of history when the first cold desserts were recorded in Asia. More than 4,500 years ago, Italians were already enjoying their signature dessert during traditional Roman ceremonies in which the icy caps of the Vesuvius and Mount Etna would be ritualistically eaten, covered in sweet honey or fruit. The perfected gelato recipe that we know today is a product of its time: the Italian Renaissance period. According to history, the powerful Medicis of Florence discovered a farmer named Cosimo Ruggieri during a city-wide cooking competition sponsored by the family. Ruggieri entered the competition with a dessert selection that combined ice and fruit juices. It was so well-balanced that it won the competition, vaulting Ruggieri into celebrity super-stardom. Although Ruggieri is historically connected with the basic gelato ingredients, it was not until Bernardo Buontalenti, an artist also known to the Medicis, that the final recipe was concocted. The base recipe was missing one important component that we take for granted today. Using Ruggieri’s base dessert model, Buontalenti added cream, creating the gelato that we consume today. Gelato is definitely a memento from the Renaissance. Gelato did not become famous on its own. 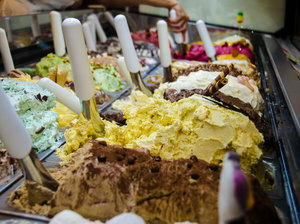 In fact, the propelling force behind gelato becoming a worldwide noun is attributed to the restaurateur Procopio Cutò. A Sicilian chef and restaurant business man, Cutò was the first to serve gelato in fancy egg cup containers with fashionable gelato spoons. This is what made gelato the rage in 18th century Europe. Gelato did not come to the US until chef Giovanni Basiolo brought the recipe to New York City in the in the 1770s. Gelato suppliers began to grow in the city, providing more recipes and tools to atone to the growing popularity of the product. Fast forward to the 21st century, and gelato still ranks among one of the most popular desserts in the planet, with hundreds of flavor varieties and thousands of locations worldwide where people can find and enjoy this historically-famous treat. You see them displayed in high-end ice cream stores, with gelato pan liners showing off bright colors and textures so the dessert can be fully appreciated. It is never too cold to appreciate a good dessert, and the fine texture of gelato is decadent to say the least.